GJ Plastics know how important advertising is for your business and events. Staying in tune with modern society online has become more and more critical. Billions of pounds are spent on digital advertising. 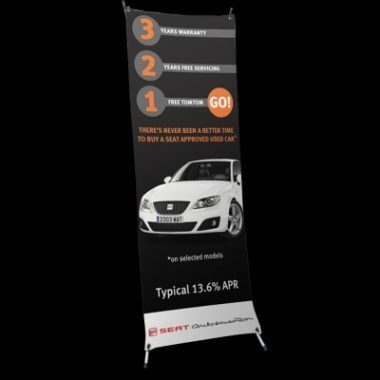 So it is easy to forget about banner displays being a simple, cost effective method of promotion. The latest large format printing technology and high quality materials utilised in our in-house graphic design department can take your concept, and create your vision into reality. Our experts directly print on the best quality PVC banner material to the highest standard in our factory outlet. Creating fantastic products every time, which are flexible yet durable, dependable and long lasting. You do not have to spend a tremendous amount of money to have successful, eye-catching advertising. Using a variety of methods are more effective than relying on digital advertising alone. You have to create an impact, which doesn’t have to mean spending the most money. Spend your money correctly, to reach the best audience for your business. For example, if you had an event located on your premises, you want to advertise that event to people who are passing by. Let people know what is upcoming or currently happening. It is not productive to promote worldwide, as your target audience is not in a different country. 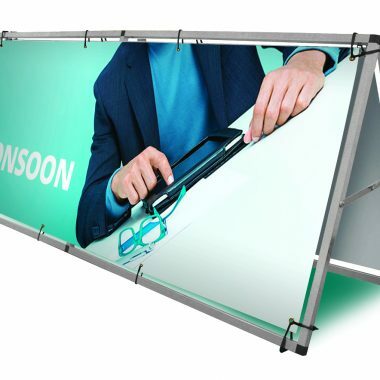 So in this situation, outdoor PVC banners are more constructive than digital advertising because potential customers are drawn by physical attraction as they pass by. People remember colourful, attractive designs. The location of the event and your business highlighted, which makes people feel comfortable knowing exactly what is happening and where. Much better than just a map on a website or vague directions, which may otherwise discourage people from attending a place or event. 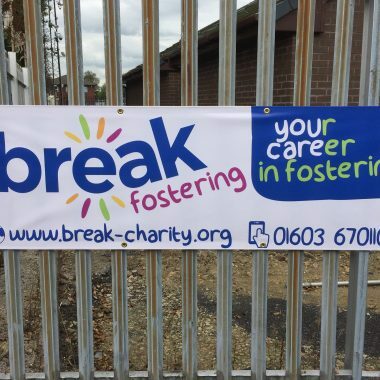 Alternatively, you could use outdoor banners to promote an achievement in your business, such as an excellent official review or ratings. 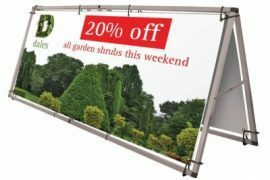 Alternatively, you could use PVC banners for promotional offers and sales, or to give a brief advertisement of your prices, products and services. Either way, outdoor PVC banners are a cost effective way to reach target audiences that matter to your business. GJ Plastic’s PVC banners have little risk of becoming torn or ripped, and are weather resistant to heat, snow, wind and rain. 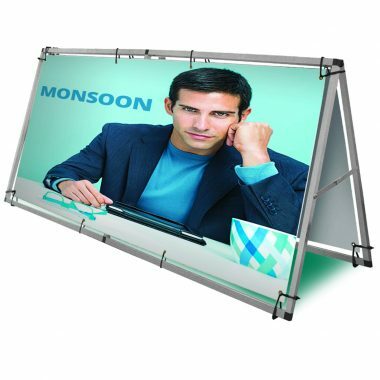 Your promotional banner keeps looking attractive no matter the conditions, making them an efficient display solution and value for money. 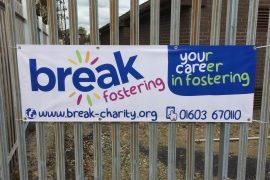 Our outdoor banners, hemmed and high quality brass eyelets fitted for secure attachment, placed in a variety of locations to suit you. GJ Plastics we are proud to provide signs and banners for professional sports clubs. 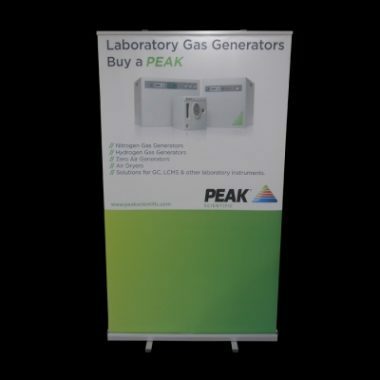 We are a trusted, reputable company with years of experience in producing and installing banners. 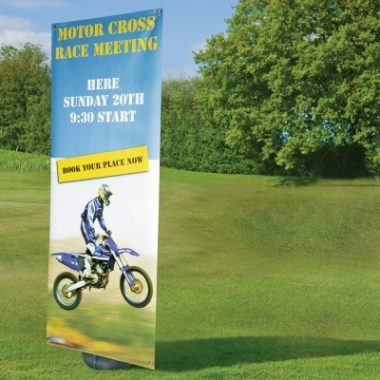 They are also ideal for social events and personal use such as parties, weddings, making the possible applications for outdoor banners multi-purpose. Remember: A plain building does not attract attention, humans need visual stimulation. If your competitors already have alternative advertising resources such as outdoor banners, your business is going to miss out. 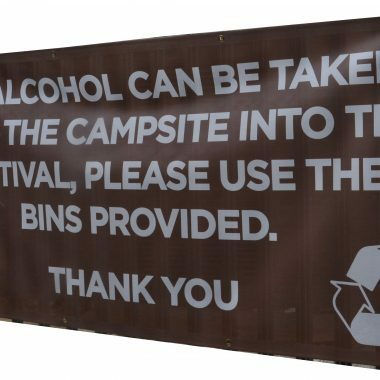 Therefore, investing in one or a few outdoor PVC banners can create a massive impact without you having to spend hundreds. If you imagine it, we will make it! 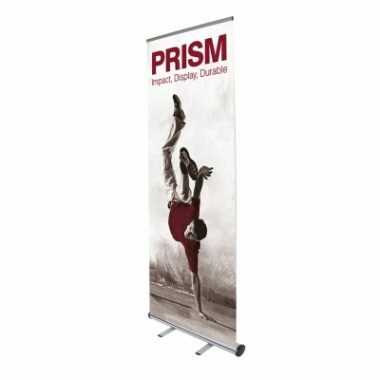 Event promotion, using Roller Banners. 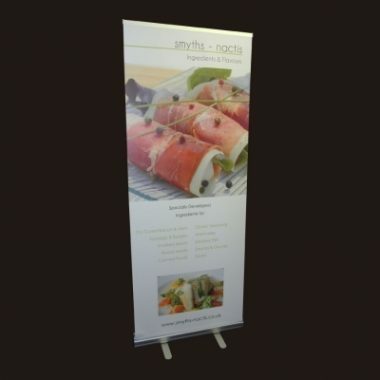 Roller banners are a very cost effective way of boosting your promotional efforts for events, exhibition or trade shows. They are easy to assemble, and transport and a lightweight carry case is provide for you. GJ Plastics Ltd aim to provide you with quality products printed in our facility by our highly trained print team. 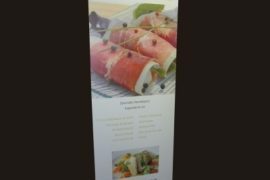 We print your roller banner on our HP Latex 360 printers using the latest 3rd generation inks which provide an excellent print quality. Send us to print ready artwork (template PDF is available on request) or for an additional charge, if you want us to design your graphic for you can talk to one of our designers. All this included in the price, and we even throw in a fast turnaround at no extra charge! 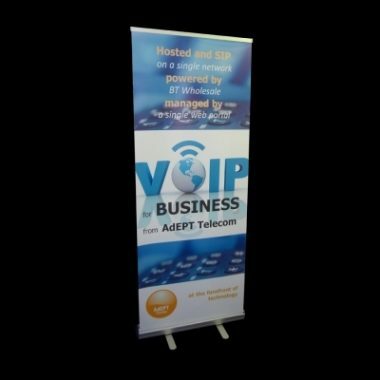 Roller Banners have quickly become a popular promotional display choice the cost effective price combined with the portability, versatility and speed of assembly. 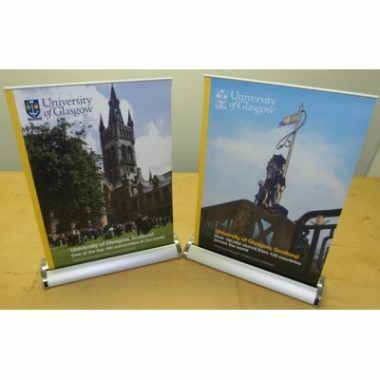 This has contributed to the increased uptake of roller banners in the exhibition, events and promotional markets. 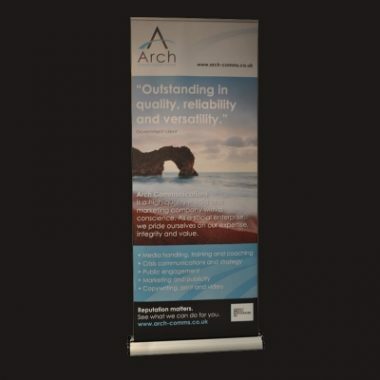 Our range of roller banners. From the desktop, floor standing offerings for internal and external use. The payment methods we provide are very secure so that you can buy with confidence. It is important to note that customers should read our print ready artwork requirements and understand that by purchasing or placing any order for printed products that this constitutes agreement to abide by them. You are welcome to call us on 0161 723 1374. Easy to assemble (simply “pull up” the graphics). Graphics protected by base in transport. Comes with a guarantee on the hardware, Delivery within 3-6 working days of receiving order and approved artwork. If you are creating the roller banner yourself here are a few suggestion that may help. Use a large font and images so that it can be seen from a reasonable distance. Contrasting your background and text colours is always a great idea. Focusing on one central message to get your point across quickly. The banners have two feet which you need to rotate out to increase the stability and provide the perfect indoor promotional signage. Remember when you are planning for your event to use posters and leaflets to promote and promotional giveaways such as pens, coasters, sweets or many more. Do not forget a suggestion box for business cards and leaflet holders for your flyers.